With the explosion of freelance creatives, remote workers, start-ups and small businesses, a culture of coworking has sprouted in cities all over the United States. Coworking spaces are offices shared between individuals and businesses who grow, learn and laugh together — in between the actual work, of course. They offer a more serious alternative to working from home — or from coffee shop. In San Francisco, where we have a huge population of artists, writers and, especially, tech experts, coworking has become one of the most important factors in building success. Whether you’re looking for a place to demo your products, to meet others in your industry, to take classes and workshops, or to energize with a snack, a coffee and a beer, there’s a perfect coworking space for you right here in the city. SoMA’s Covo balances life and work beautifully. Their 24/7, pet-friendly space includes a coffee shop, tap room, full-service café and even a nap room so you can re-energize when you need it. As a member, you have access to large classrooms, company branding services, AEC design services, exclusive events and much more. But even if you’re not a member, you can spend time in the public coffee shop and tap room or rent the hourly coworking lounge at $4/hour. Test out a free Covo Day and you won’t want to leave! Though the venue itself is not a non-profit, Minnesota Street Project has been home to some of the most impressive art-related nonprofits alongside artists and in-house galleries. Designed as a new way to support local creators, 100% of profits are used to support the artists, galleries, and institutions housed inside. 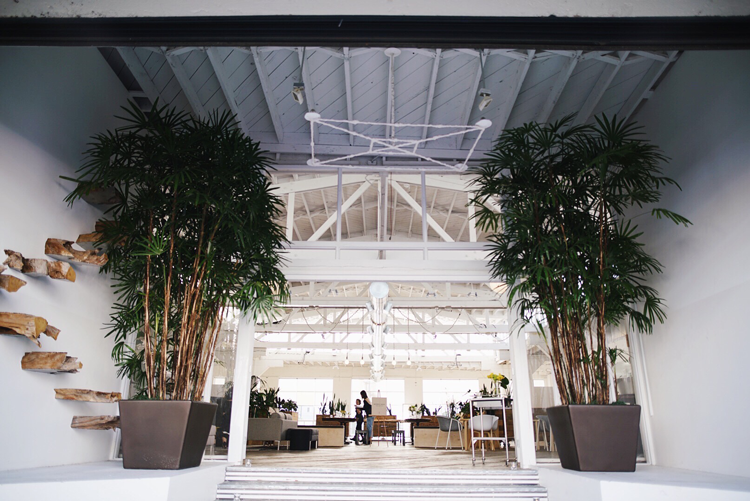 Spanning three Dogpatch warehouses, you’ll find 11 permanent galleries, three spaces for rotating exhibitions, a 4,600 square-foot Atrium available for programming and events, a restaurant, the Altman Siegel Gallery, the Adrian Rosenfeld Gallery and approximately 30 private artist studios. The gallery spaces at 1150 25th St. and 1275 Minnesota St. are open to the public so stop by to get a feel for this stunning art community! With a spacious workspace, a prototyping shop and a retail showroom, the Archery is the ideal coworking space for makers. As an all-in-one workplace, you can take your idea from concept to prototype and eventually to the sales floor. When you’re craving some outside inspiration you can grab a coffee at FRONT, which is possibly the most creative coffee spot in the city and is housed in the building. And, because the space houses a full commercial kitchen, as a member of The Archery you’ll also have the opportunity to join the chef’s table and chefs-in-residence for lunch, dinner and the occasional spontaneous tasting. You can find more information and apply for membership on the website. Housed inside the Union Square Westfield San Francisco Centre, Bespoke offers an interesting add-on option for tech workers and companies. Their demo stations, located outside the working space and inside the mall, are a place where brands can learn, test and grow with exposure to 20 million annual shoppers. Inside the venue, you’ll find a curated community of retail and tech entrepreneurs — and you can meet them on the bocce ball court or the bouldering wall! With a pay-by-hour system and a seamless app, Workshop Cafe almost won our “day-to-day workers” category, but that was before we tasted the food! Made fresh on site every day, you’ll find a menu of specialty coffees, shakes and parfaits, hot cereals and bagels, bowls for breakfast, lunch and dinner, sandwiches, wraps, snacks, salads and more. The best part is, through the app, you can get all of it delivered to your desk, private room, booth, table or conference room! Yes, even the beer and wine. Sandbox Suites has locations in SoMA, Lower Nob Hill, South Park, Berkeley and Palo Alto. If you’re a member at one location, you’re a member at all locations! So no matter where your life, your meetings or your errands take you, you’ll have a place to get work done in the Bay Area. Each location offers private offices, desks and virtual offices, a low-cost option that comes with mail and package receiving. Join the successful lineup of teams like Airbnb, The Bold Italic, Blue Bottle Coffee Co., Cisco and others who have called this space home! 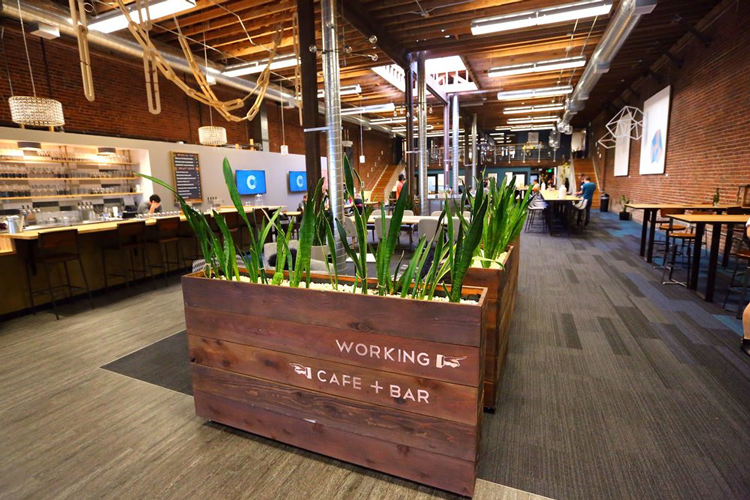 Parisoma stands out from a lot of other coworking spaces both for its culture and its educational opportunities. You can work all day in the open, airy space and meet with other freelancers, entrepreneurs and remote workers or reserve a dedicated desk or private office. No matter what option you choose, your membership comes with access to multiple classes and workshops throughout the month including topics like Scaling Financial Models for Startups and Building Your Business Model Canvas. 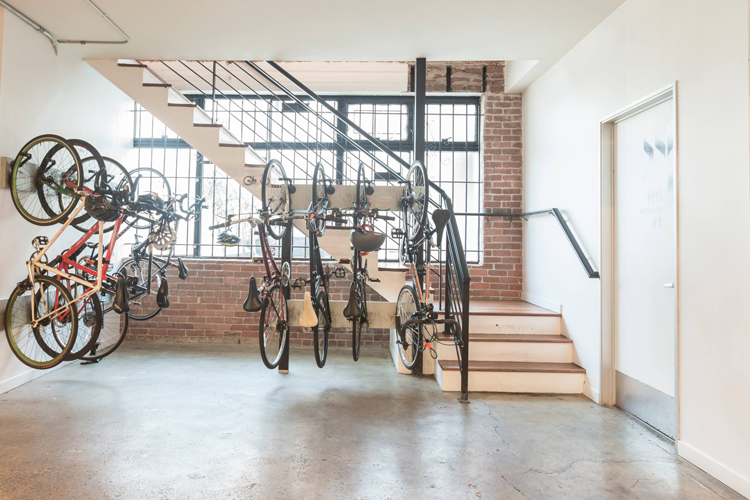 The networking, camaraderie and connections are an extra bonus — just like the indoor bike racks and full kitchen. Community, networking, creative inspiration and powerful partnerships are just a few of the requirements for growth when you’re operating a burgeoning start-up. Inside Eco-Systm, the space is filled with beautiful fine art, murals, open spaces, and tech-filled offices that can help you every step of the way — from independent creator to small business. Because the venue shares space with Temple Nightclub and Mirus Art Gallery and has its own sunny patio, you’ll have plenty of opportunities to meet the community of workers around you. The story of CANOPY begins with design. Built from the ground up by M-PROJECTS and designed by friends Yves Behar and Amir Mortazavi, the invigorating space is filled with natural light and features private and open spaces that merge craft and tech as only a San Francisco institution can. If you’re inspired by natural light, innovative architecture, modern details and stunning black marble, this is your new workplace. Check out the additional amenities — including 24/7 access, Blue Bottle Coffee and Herman Miller Ergonomic Furniture — and book your spot today. 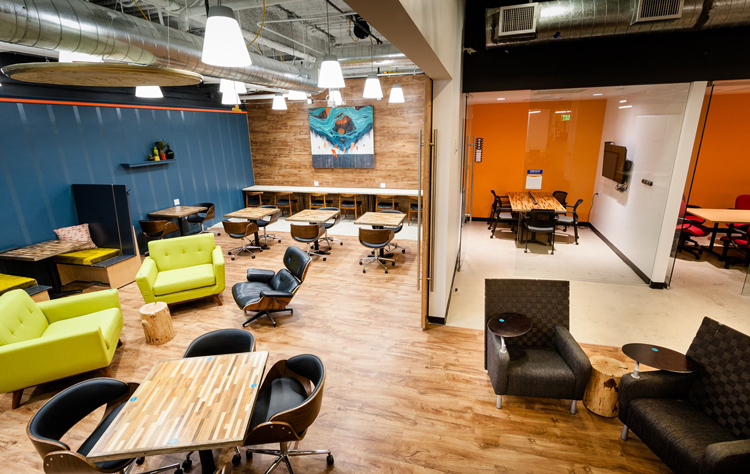 Connections is one of the best and most steadily growing coworking spaces in the city. At this point, it’s still a bit of a hidden gem and therefore offers a quiet space for creatives, techies and entrepreneurs of all kinds. You can work near a cozy fire on the first floor or in a library and conference room on the lower level or outside on the sundeck. But no matter where you settle in, members have access to the fitness room, laundry room, onsite kitchen and complimentary refreshments. Do you have a favorite coworking space in the city? Let us know in the comments!